TRFJ2018 Race Results and Thank You! WHAT IS A VIRTUAL RUN? There are no rules, no finish times, no distance restrictions. Run/walk a treadmill, around the neighborhood or don’t run at all. It’s up to you. It’s on your time. Form a Virtual TEAM and set up a fundraising page. We welcome all who want to make a difference in the fight — raise awareness, fund research, support healing. 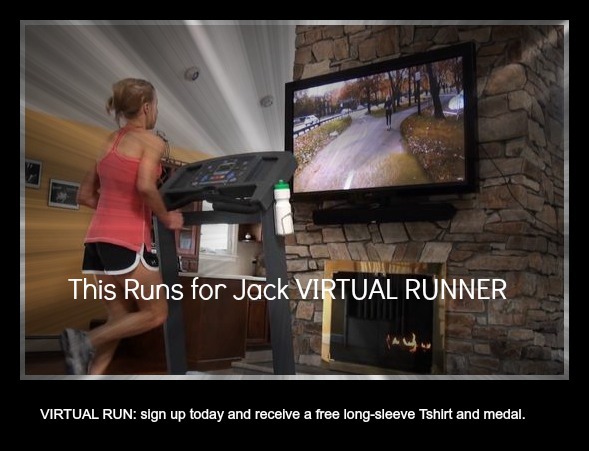 Virtual Runner started at the 2013 “This Runs For Jack” when friends from all over the country wanted to support the 5k, but could not make the trip to Illinois or had a calendar conflict. "We envision a world where every adult and child is aware of the risks of melanoma and takes preventative measures; where those who suffer from melanoma receive comfort and healing; and ultimately, where every case of melanoma will be completely curable." Our mission is to realize this vision by raising funds and providing programs to raise awareness, fund research and promote healing. Contact Us - ©2016 Jack's Fund, a non-profit 501c3 charity.